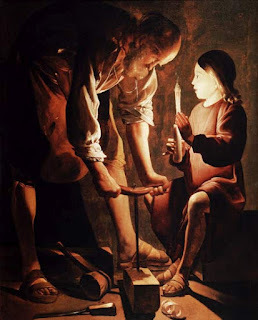 The feast day of St. Joseph the Worker was established in 1955 by Pope Pius XII. May 1st was chosen to enhance May Day with Christian meaning. May Day or the International Workers' Day, was secularly established for unions, workers and socialists. On the feast of St. Joseph the Worker, the church proclaims the high dignity of all work. Work is a gift from God and man enhances his own dignity when he collaborates with God. The Church proposes St. Joseph as an example of someone who worked to provide for his family. All honest work has value. God intended work to allow us to create and follow His example. With the fall of man, work became burdensome. But with and through Jesus Christ, work becomes a means of sanctification. Do I put my best effort into all my work, whether paid full time job, work in the home or volunteer work? Do I have a sense of urgency and thoroughness in my work? Do I properly care for the instruments with which I work? Do I offer any/all sufferings of my work to Jesus for the Salvation of Souls? Including feeling tired, overwhelmed or incapable? Do I give a good example to all by work done well? Let us model our work after St. Joseph and be diligent, honest, thorough and cheerful in all we do. Let us also pray for all unemployed and underemployed who are seeking meaningful work. 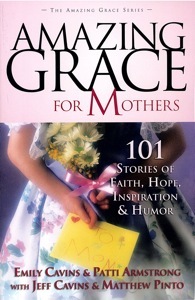 Great Book for Mother's Day~order a copy today! Amazing Grace for Mothers will lift your heart and send your spirit soaring. You will laugh, you will cry, but most of all you will be refreshed by stories of love, inspiration, miracles, and God's amazing grace. This collection of 101 stories will bring you the warmth and support of other women, all dedicated to the same glorious role - motherhood. What I love about this book is that each woman's story is short enough for a busy mom to read in between all the other things she is doing. I can keep a copy in the car, and can read one story while waiting in car line. Or at night before I fall asleep, I can get one inspirational story in and fall asleep tired, but encouraged! Maura Buete first gave me this book several years ago and it is a treasure. Get one for yourself, your mom or your girl friends and celebrate Motherhood! Please take a moment to pray for our Holy Father's intentions. This is what he said today... "I find myself on the last stretch of my journey in life, and I don't know what is awaiting me." "I know, however, that the light of God exists, that He is risen, that His light is stronger than any darkness and that God's goodness is stronger than any evil in this world, and this helps me go forward with certainty." I highly recommend the new book out about the Holy Father. His life story is amazing. We truly have a holy wonderful pope. May God grant him many years. 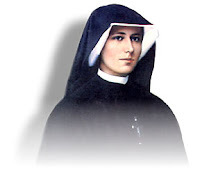 On October 5, 1938, a young religious by the name Sister Faustina (Helen Kowalska) died in a convent of the Congregation of Sisters of Our Lady of Mercy in Kracow, Poland. She came from a very poor family that had struggled hard on their little farm during the terrible years of WWI. Sister had had only three years of very simple education. Hers were the humblest of tasks in the convent, usually in the kitchen or the vegetable garden, or as a porter. On February 22, 1931, Our Lord and Savior Jesus Christ appeared to this simple nun, bringing with Him a wonderful message of Mercy for all mankind. By this image, the Church's doctrine on justification and grace are explained. First, by itself an image is merely a painting, no matter how beautiful and expressive. Yet, it can point us the mysteries of the faith and dispose us to grasp and receive what it represents, in this case the Divine Mercy. It is thus a vessel, not the source, a reminder, not the reality. The reality is the merciful fountain of grace flowing from the pierced Heart of Christ on the Cross, and flowing out visibly to represent the visible, that is the sacramental, signs of grace, Baptism and Eucharist, standing for all the sacraments of the Church. Blessed Pope John Paul II canonized St. Faustina in 2000 and set the Sunday after Easter as the day to celebrate the Divine Mercy of God. 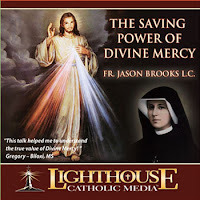 To learn more about Divine Mercy, CLICK HERE for Fr. Jason Brooks inspiring talk. The Western Schism divided Christianity first between two, then three, popes. Clement VII lived at Avignon in France, Urban VI in Rome. Vincent was convinced the election of Urban was invalid (though Catherine of Siena was just as devoted a supporter of the Roman pope). In the service of Cardinal de Luna, he worked to persuade Spaniards to follow Clement. When Clement died, Cardinal de Luna was elected at Avignon and became Benedict XIII. 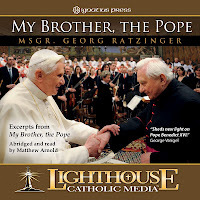 I just finished reading a fantastic new book from Ignatius Press, My Brother the Pope. 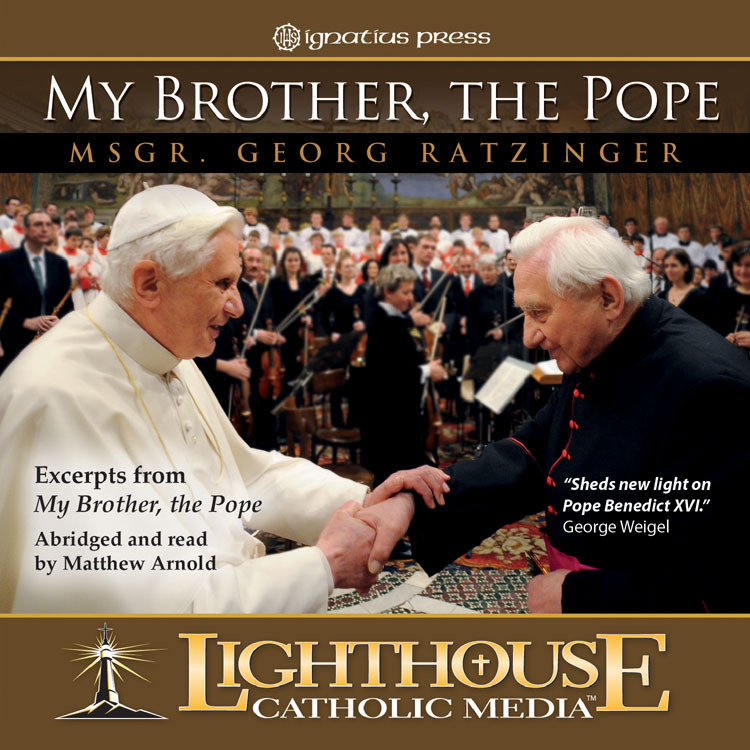 Before picking up a copy, I didn't even know the Pope had a brother, and I certainly didn't know that the Pope's brother was also a priest, ordained on the same day as the Pope over 60 years ago! 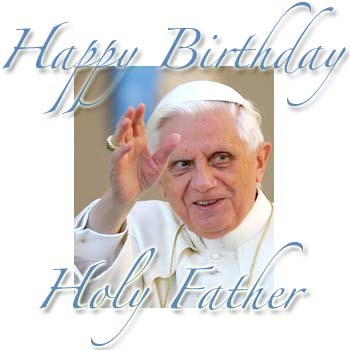 Born in 1927, Joseph Ratzinger enjoyed a sweet childhood in Bavaria in the late 1920s and early 1930s. His father was a policeman/civil servant. His parents married later in life and had a daughter, Maria and a son, Georg, before Joseph. One of the family "secrets" is that the family prayed the rosary just about every day. The boys were altar servers from an early age. Mass and the Eucharistic were very important to the family. They regularly received the sacrament of confession. When World War II began, both brothers were in-scripted into service of the Nazi. Their studies for the priesthood were postponed until after the war. They were both ordained June 29, 1951. The story continues through the Pope's life as University Professor, Bishop, Cardinal and of course, Pope. I have always loved Pope Benedict, but reading this book really gave me insight into his intellectual and somewhat shy personality. His Episcopal motto of "Coworkers for the Truth" is so appropriate. Throughout his entire life, he has searched for Truth and shared it. His humility is very evident, as is his love for his family. Anyone would enjoy this book, but particularly Catholics, those who like biographies or those who love reading about the great events of the 20th Century. His life encompasses it all. If a man wants to be always in God's company, he must pray regularly and read regularly. When we pray, we talk to God; when we read, God talks to us. 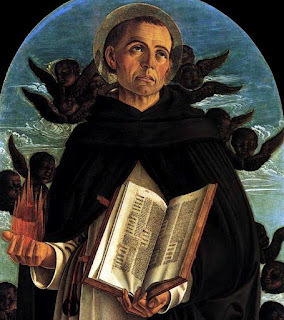 Born in Cartagena of a family that included three other sibling saints (St. Leander, St. Fulgentius and St. Florentina), he was educated (severely) by his elder brother, whom he succeeded as bishop of Seville. An amazingly learned man, he was sometimes called "The Schoolmaster of the Middle Ages" because the encyclopedia he wrote was used as a textbook for nine centuries. He required seminaries to be built in every diocese, wrote a Rule for religious orders and founded schools that taught every branch of learning. Isidore wrote numerous books, including a dictionary, an encyclopedia, a history of Goths and a history of the world—beginning with creation! He completed the Mozarabic liturgy, which is still in use in Toledo, Spain. 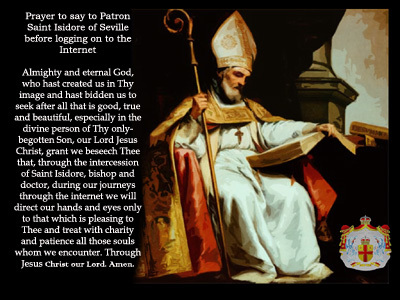 For all these reasons, Isidore has been suggested as patron of the Internet.